Here are a few more maps to flesh out yesterday's post. 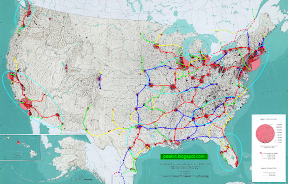 The network I developed previously is overlaid on a population distribution map in this image. Now, the map is from 1970, but as far as I know no entirely new cities have been built since then. Growth since then has been greater in the South and Southwest, so the sizes of the circles (urban population) and density of the dots (rural population) is somewhat wrong. But, in general, Americans are living in the same locations today that they did back then. As you can see, I've hit nearly every major city with a red or blue line, excepting those in the Mountain states. The green or yellow lines hit most of the rest. One area I need to investigate is the western Virgina/western North Carolina/eastern Tennessee region. There are a lot of medium-sized cities there, and I think I missed an important line or two. Here is the network plus a whole slew of routes that might be considered for passenger rail if the country was to go all out on upgrading and electrifying the rail system. I've included every route that seems plausible. There are a few intentional omissions because of physical geography and size (Grand Junction, Medford), because of isolation and size (Roswell, Bismark), and because of geography and density (north of Lake Superior). 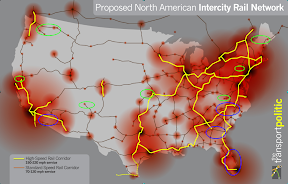 I have also excluded the dense commuter rail networks that exist around Northeast Corridor cities and Chicago, which would get even denser if rail had a higher priority. There's probably a bunch of unintentional omissions, too. I tried to avoid filling the Big Empty Spaces out west with extra lines, as the area really is empty. Nonetheless, I ended up with a several routes that would be well-utilized only in a world where flying or driving was prohibitively expensive. I also compared my plan to this plan from The Transport Politic. The blogger there did a very detailed analysis using a mathematical model to help decide on where to run the HSR lines. Nonetheless, I have a number of minor quibbles (marked in green) about gaps and spurs in the secondary network, and four larger questions (marked in blue) about the HSR lines. Working west to east, the first is about the Los Angeles to Phoenix connection, where I think it might be a mistake to bypass Yuma. There are about 300,000 more people on a southern route, the geography looks easier, and there could be a connection to San Diego via two decent-size cities in Mexico (it's remotely possible). The diversion does cause a 30 minute time penalty, which pushes the duration of the downtown-to-downtown trip to about the limit. But LA is such a vast area that many of the trips would originate east of downtown, and those journeys would stay well below the limit. Next, the gap south of Macon seems like a missed opportunity. The key here is not to go straight to either Savannah or Jacksonville, but to hit a point between them and fork. Farther south, running the main line on the west side of the Florida peninsula would substantially increase the time to Orlando and Jacksonville from Miami. I think the importance of tourism to the state needs to be acknowledged, and running the line on the east side would pass more touristy areas. Plus doing an EIS for trackage across the Everglades is too horrific to contemplate. 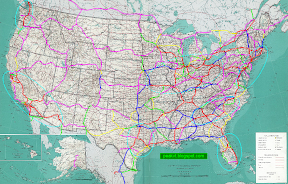 Finally, the kink to hit all the cities in North Carolina means the line won't really be HSR. The distances between them are just too small. That's why I bypassed Durham, Burlington, Greensboro, Winston-Salem, and High Point with the main HSR line between Raleigh and Charlotte. The branch route could be served with HSR track and trainsets. But station dwell and acceleration/deceleration times start to dominate with that many stops, so the track might be built only to MSR standards. I think there would be about a 40 minute time penalty for the western route over a direct connection. That's it for now. I'm all HSRed-out. Update: One last gasp. Here's the extended system overlaid on the population map.